Asus has launched ZenFone 5Z phone on July 4, 2018 whereas OnePlus also launched OnePlus6 device a month back. Both of them have similar features to know, compare and check which one is the best at the moment. Both the smartphones released with Snapdragon 845 processor, so, let us see and compare these two gadgets with other features and specifications. Before we compare these two popular smartphones, please have a look on their specifications. Asus is a Taiwan company whereas OnePlus is from China. Asus is an older brand than OnePlus. Camera: OnePlus6 comes with 16MP+20MP back and 16 MP front whereas ZenFone 5Z comes with 12MP+8MP dual rear, and 8MP front with EIS. Both of them have best low light cameras without any doubt. What's the main difference between OnePlus6 vs ZenFone 5Z smartphones? 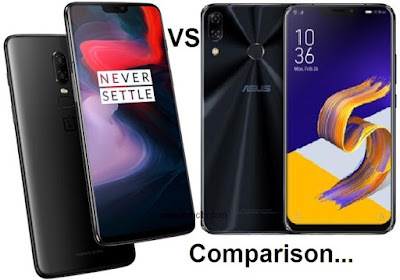 Asus ZenFone 5z is better in price compare to OnePlus6. Both the phones have pros and cons when compare among them. OnePlus6 lacks AI feature though it has water resistant and dash charge those features lacks in ZenFone 5z. Likewise, Face unlock is better in OnePlus6 compare to ZenFone 5z smartphones. Playing games like PubG gives better gaming experience in both. Asus device has two speakers compare to OnePlus. These are few differences between them along with price ranges. Color may differs on this devices. So, you have to decide right now to buy the smartphone. ZenFone 5 and ZenFone 5 Lite also launched and will be available from July 9, 2018 at Flipkart. Honor 10 AI phone also has similar feature which we so would compare them at later. All these devices available from Flipkart on stated date. Tips: You may get discounts and offers from ICICI credit or debit card, and Jio cashback offer also available.